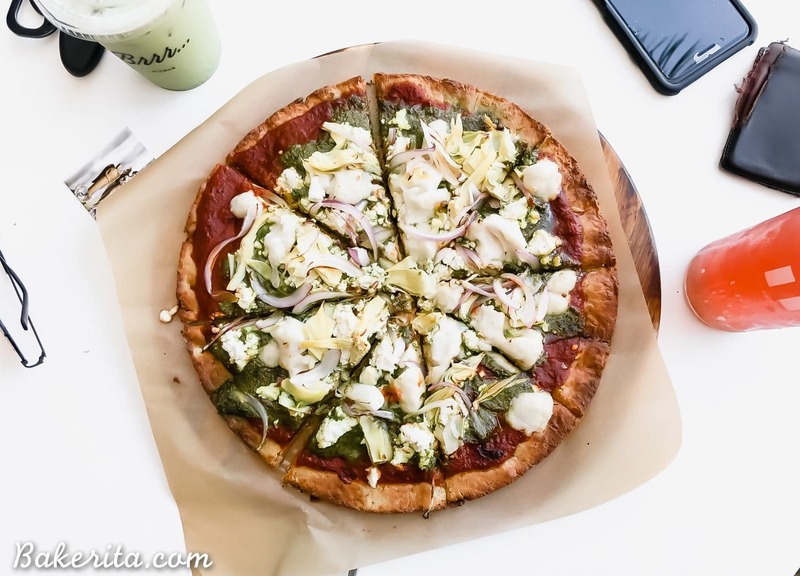 This San Diego Guide includes all of my favorite healthy places to eat in all parts of the city! There are options for gluten-free, vegan, vegetarian, and paleo eaters. 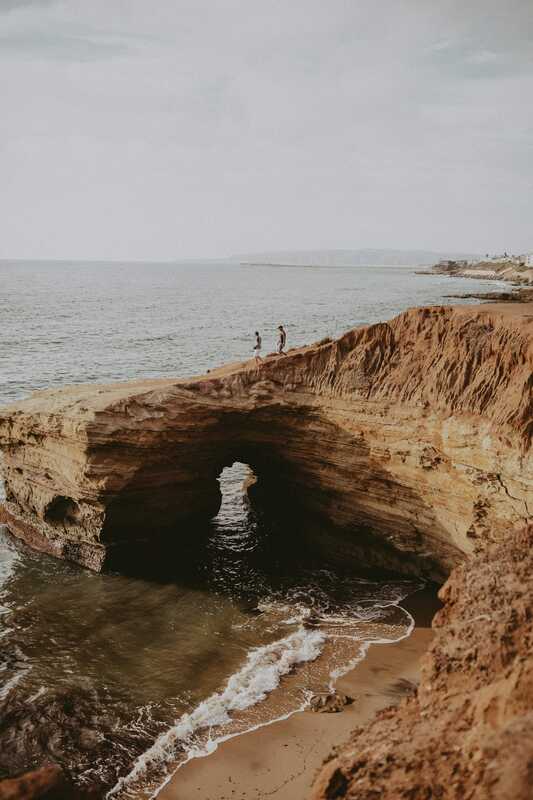 I’ve also included some of my favorite San Diego activities and hotels! Thanks to Expedia for collaborating with me on this post. I’ve been living in San Diego for 20 of my 25 years on this planet, so it’s fair to say I’ve eaten my way through this city. Since coming back from living in Seattle, and I’ve gone hard into finding all of the best healthier places that San Diego has to offer. Since we tend to be a pretty health-conscious city, there’s a lot of goodness to be found. Some of these places are longtime favorites while others are more recent faves, but if it’s on this list, I’ve eaten there and LOVED it. 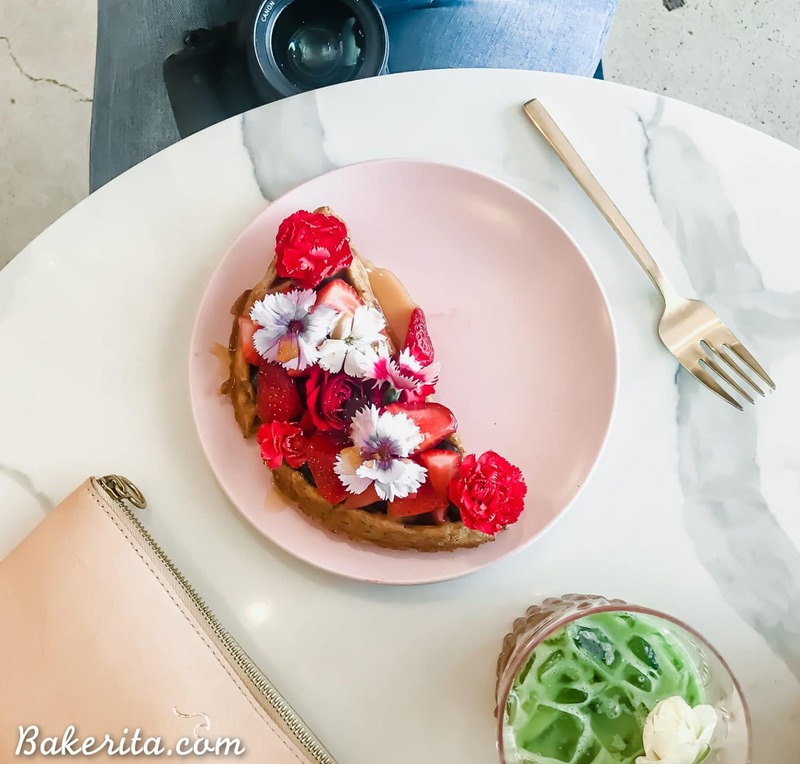 I’ve included my favorite restaurants, cafes, places for coffee/matcha/tea, and my favorite places to explore and fun things to do. I hope that whether you’ve lived here forever, or you’re just visiting for the weekend, that this will help you navigate San Diego and experience lots of great food and beautiful scenery. xoxox! Such a sanctuary! This place is not only delicious but walking in is so soothing with all of the plants and great vibes. 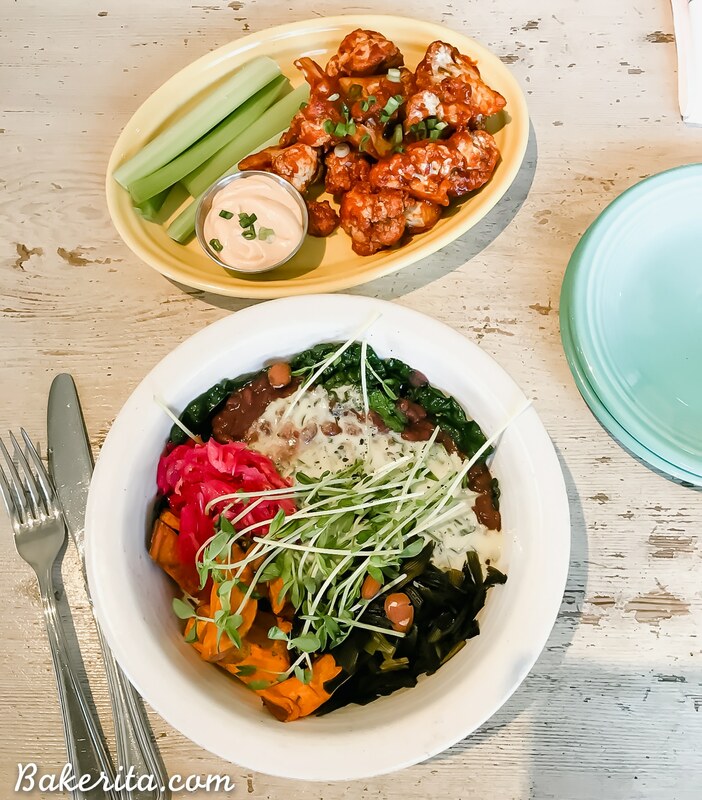 It’s 100% vegan and their specialty is all sorts of delicious Buddha Bowls. I particularly love the Legendary Hero Bowl, the Havana Bowl, and the Aphrodite Bowl. The flatbreads (all GF) are also tasty – I’ve only had the truffled mushroom and I’d recommend it. They also have a case full of desserts, mostly raw and all gluten-free, which are all so rich and decadent. I love the area where Eve is located too. If you come here, make sure to spend some time walking around and exploring! So much to see around there. Eve will also regularly host events in their back room, so check online to see what cool things are going on here. This yoga studio/event space/vegan cafe is MAGIC! It can be a little tricky to find since you’ve got to walk into an unassuming building in La Jolla and head to the elevator in the back. Take it to the top floor, where you’ll step onto the roof deck and see the aerial yoga set up. There’s a little shop with crystals and clothes and other cool things and a super tasty gluten-free and vegan cafe. The ravioli and caesar salad are favorites of mine, along with the raw carrot cake. My dad can’t come here without getting the cheeze burger since he’s so obsessed with it. The bowls are also great, and they have a large menu of smoothies and acai bowls. Love this place! This place is one of my favorites and I’m generally a creature of habit when I come here. It’s ENTIRELY vegan and most of the menu is gluten-free as well. The have delicious drinks + desserts too, most of which are raw. If I’m going for breakfast, I usually get the flax pancakes with berries and coconut cream and a matcha. If it’s dinner, I get the Whole Bowl (pictured) and if there’s someone to share with me, some Buffalo Cauliflower. SO. GOOD. This place is walking distance from my house and one of my go-to places for delicious juices, smoothies, and acai & pitaya bowls. The acai bowls have different topping options, including an option for all paleo toppings (which is so deliciously crunchy). They also have amazing GF toasts – I love getting the almond butter banana toast with strawberries swapped out for the bananas. If you want a truly delicious smoothie, get the Strawberry Maca. It tastes like a strawberry milkshake. Let me start with this: it’s a pizza place with an entire VEGAN MENU. Not pizzas where vegan cheese is subbed in, but an entire lineup of pizzas that are made specifically to be vegan, with vegan white sauce and vegan meats and cheeses and all. They also have a great gluten-free crust, gluten-free pasta dishes, and their meatballs are gluten-free too, so if you want a gluten-free meatball on your pizza, this is the place to come. When I’m ordering pizza, this is always where I order from. My go-to is the Little Rock pizza. It sounds weird but is beyond delicious, though you really can’t go wrong with anything from here. I’ve never been disappointed with a meal from here. Another one of my take out go-to’s, but eating in here is a treat too. I love their fresh spring rolls, pad se ew, and garlic edamame. The zen soup is another one of my favorites – so filling and unique to Plumeria. They also have tangerine chicken (gluten-free and vegan) and holy cow – it’s JUST like Panda Express orange chicken. That dish is one of the only times I’m down for meat substitutes. This place is always popular with meat-eaters too! This vegetarian restaurant has similar and delicious food all in a super casual, serene setting. It’s right near my yoga studio (Pilgrimage of the Heart) so I’ll stop by a lot after a class. I love the Yoga Bowl and the Rama Bowl (see below). I’ve never had it, but the Neatloaf has always got rave reviews from my dining partners. The soup of the day has always been delicious when I’ve had it and a lot of times they’ll have a super tasty raw cheesecake for dessert. I love this spot for a quick, healthy meal! It’s a big restaurant so there’s always seating, it’s super cutely decorated, and they have meals for you whether you’re gluten-free, vegan, or eat whatever you want. It’s an order-at-the-counter kind of place, so not too fancy – perfect for lunch or a quick dinner. I love the Chopped Vegetable Salad, Organic Kale Salad (minus the cheese), Mother Earth Bowl (I sub brown rice or quinoa for the grains to keep it GF), Forbidden Rice Bowl, and for sides, I can’t get enough of the Spicy Japanese Eggplant. 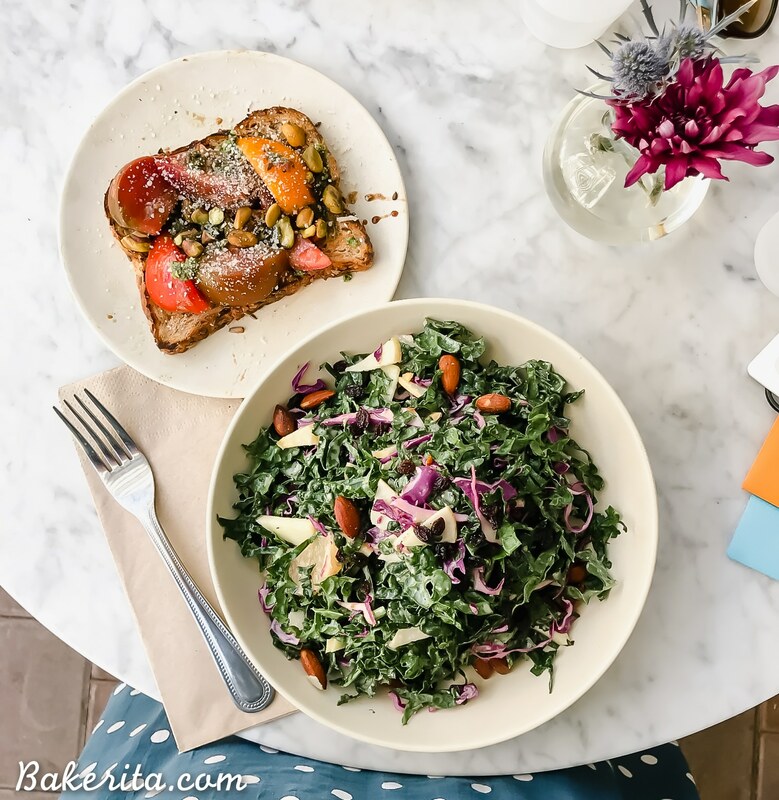 In the photo below, I’m eating the Kale Salad (no cheese) and the Heirloom Tomato Toast (which I also get with no cheese – had to send the one pictured back because they put parmesan all over it). Another amazing juice bar. It’s on the more expensive side, but everything is made with high-quality ingredients and the smoothies, juices, and foods are all incredible. I love the Bluephoria smoothie and the Overnight Oats from here, but I’ve had so much of the menu and everything I’ve had is great. They also have amazing acai bowls. If you have time to eat there, I’d recommend – they come in a BIG bowl when you get it to eat there. I also love the warm soup bowls they have – the soup changes but it always comes with quinoa and cashews and is so warming and delicious if that’s what you’re into the mood for. One of the OG healthy cafes in San Diego! It’s tucked into a very unassuming strip mall with all sorts of paleo/vegan options. The menu is 100% gluten free and they’re open for breakfast and lunch. If you’re looking for dinner, go to their other restaurant, Nectarine Grove (below). The waffles are so good for breakfast, and you can also find them in the frozen case to bring home and make yourself (I would recommend doing this). For lunch, I love the Falafel & Hummus, which you can get in a salad or a wrap. All the panini’s I’ve had are great too. If you like their bread, you can also grab some of that from the freezer case to bring home with you. The millet rolls and rosemary bread are two particular favorites of mine and I rarely leave without picking up one or the other. This placed opened not too long ago, but it quickly became one of my favorite restaurants. I had already loved Healthy Creations (right above this), and this place is owned by the same owners. The entire restaurant is gluten-free and everything is made with clean ingredients. It’s mostly paleo too with tons of vegan options. My go-to is the Pesto Pizza with vegan cheese and I ask for it well done so it comes out with a crispy-on-the-bottom crust. They don’t use weird fake-tasting vegan cheeses, they taste like they’re made in house – not sure if they are but if they’re not, they’re sourced from good brands. I also love their Roasted Veggie Bowl. To drink, I usually get an iced matcha with housemade almond milk or a Bambucha Kombucha – one of my favorite kombucha brands. They also have Bulletproof-style coffees, if you’re into that! If you’re at the mall, go here! They have a location at Fashion Valley Mall and at UTC mall. They’ve got tons of healthy options and there’s something for everyone. When I want healthy food but am going out with people who aren’t necessarily healthy eaters, this is usually a place we’ll go because it satisfies everyone. 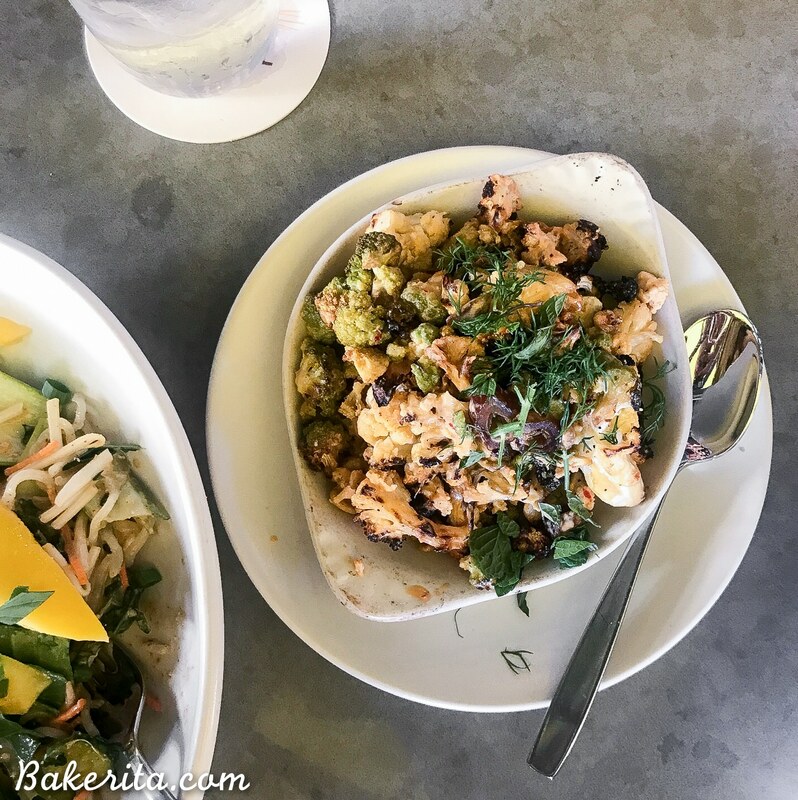 I love their cauliflower starter (MUST GET – I could eat the whole thing by myself and have done it many times, see below for pic), the Butternut Squash Pizza on GF crust (get it well done), and the Seasonal Ingredient Salad (without the cheese). The squash pie and chia pudding for dessert are also delicious. This has been a family go-to since I was a youngin’! It’s a beautiful spot right by Fletcher’s Cove Beach in Solana Beach. There’s more around now, in Encinitas and some other spots in SD, but this location is by far my favorite because of the ocean view. My go-to order is the Baby Reds and Greens salad, and when I ate meat, I loved the Dual Delight with coconut rice. The whole grain pancakes (gluten-free) are also delicious for breakfast. Claire’s has a soft spot in my heart not only because I’ve known the owner, Claire, for most of my life (and she MAJORLY inspired me to bake when I was little), but also because working in the Claire’s bakery was my first job. The food is all amazing and made with so much love by everyone who works there. It’s not the healthiest place on the list, but they have a number of gluten-free, vegetarian, and vegan options. For breakfast, the Clairecakes are hard to beat (they have a gluten-free version too). One of my go-to faves since high school is the fried green tomato sandwich – so good. Try something from the bakery before you go, too! I discovered this place more recently, but it’s a great find. It’s 100% vegan and on the more gourmet-vegan side. They have some incredible dishes and pizza. I’m in love with the vegan gluten-free macaroni and cheese – it’s the best vegan mac and cheese I’ve found anywhere. They also have a delicious pizza menu that can be made with regular crust or a gluten-free socca crust. The cauliflower side and truffled potatoes are also good choices. BONUS: Donna Jean is adjacent to a vegan burger place called Evolution that’s more casual but also super tasty. This is a fairly standard pizza place in North Park, located in a former post office. 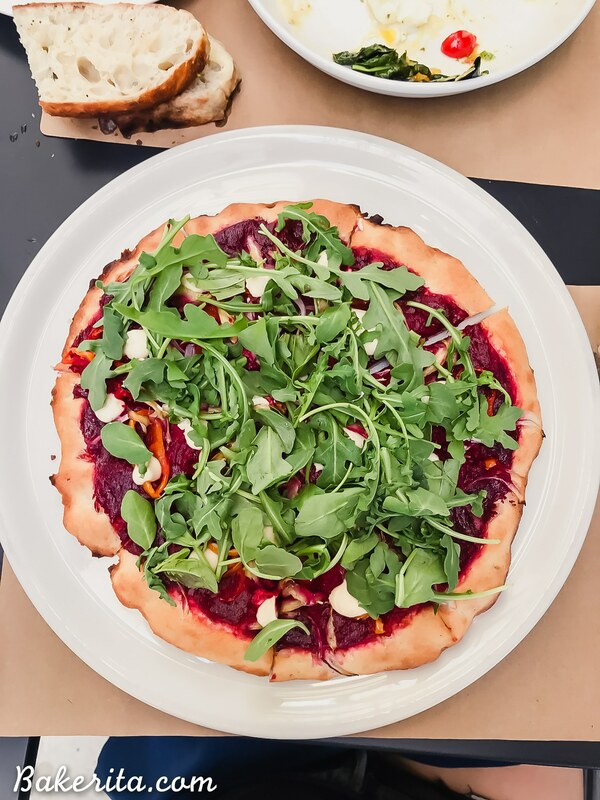 BUT – they have incredible gluten-free pizza crusts and a DELICIOUS vegan pizza (pictured below) that has beet puree, almond and hazelnut ricotta, and all sorts of deliciousness on it. This pizza alone is the reason this place is on the list, so I can’t vouch for anything else, but if you’re in the area and want a great vegan pizza, you gotta try it. I’ve only been here a few times but it’s an organic, very GF-friendly eatery so I had to include it. I usually go for the Thai Salad here, but the sandwiches are raved about by whoever I’m eating with. They also have burritos that are generally way healthier than the ones the Mexican places are selling, and a taco plate that uses Siete grain-free tortillas. They also have a coconut yogurt parfait that uses my favorite locally made coconut yogurt – Edible Alchemy! This place is super Instagrammable – all pink and green with tons of plants and super cute vibes. The drinks are also DELICIOUS (if a bit expensive). I usually get the iced strawberry matcha with coconut milk, which is made with freshly pureed strawberries. It’s so refreshing. I’ve also tried the gluten-free vegan waffles and they’re so delicious, and they come topped with edible flowers so also insanely beautiful. The gluten-free vegan donuts are also awesome. I’m pretty sure all the food they serve is vegan, and it’s all gluten-free as well, except for the toast. Love this spot to hang out and do work, though it does get crowded! It’s an adorable spot right off University Ave in Hillcrest and is right next to North Park Nursery, so you can check out the plants after getting your drink. The Lavender Honey Latte is delicious and they make a great Matcha Latte too. The Lavender Grey Tea is also sooo tasty. I’ve never eaten here so I can’t speak to their food, but it all looks beautiful and I know they have gluten-free options available. I had to include this place because I’m currently sitting here, sipping on a delicious matcha. I can’t vouch of the menu since I’ve only gotten drinks here, but they have a pretty extensive food menu for a coffee shop, including locally made empanadas (including a vegan version – swoon), sandwiches, snacks, acai bowls, and smoothies. They also have an adorable patio that’s perfect for hanging out and you can totally bring your pup along. Visit Balboa Park to walk around and visit the museums – make sure to check out the art shops in Spanish Village! Go to the Torrey Pines Glider Port around sunset to watch the hang gliders – and go out yourself if you’re feeling brave! Looking for somewhere to stay while you’re visiting? Find an awesome place to stay in San Diego on Expedia! The Lodge at Torrey Pines is incredibly beautiful and luxe, with amazing restaurants and the most insane spa. It’s pretty centrally located too – close to La Jolla and Del Mar, and not too far to either Encinitas or Downtown. The Pendry is a newer hotel – I haven’t been but I’ve heard great things. They have six restaurants and bars in the hotel, a spa, and it’s located in a great spot downtown. Rancho Valencia in Rancho Santa Fe is a super luxe and beautiful small hotel. I’ve gone for dinner there, to yoga, and the spa, and it’s always been a luxurious and wonderful experience. Hotel Del Coronado is a classic, iconic San Diego hotel on the island of Coronado. It’s right on the water and in the winter, they have an ice rink right outside of the hotel. Even if you don’t stay here, it’s a great place to visit for the day! Motel Del Mar on the Beach is the place to stay if you want to be ON the beach without spending tons of $$$! It’s on the sand in Del Mar, and steps away from a couple great restaurants!